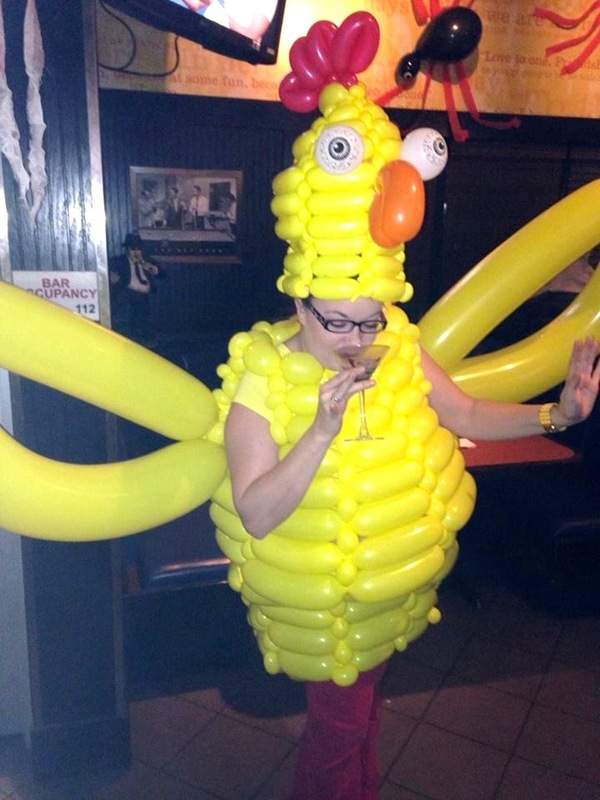 If you want to immerse yourself in pure joy and happiness, wear a balloon costume. They are so fun and playful, it’s hard to describe the feeling. Everyone wants to take their picture with you, and everyone wants to dance with you. Everyone just wants to be a part of this incredible experience. 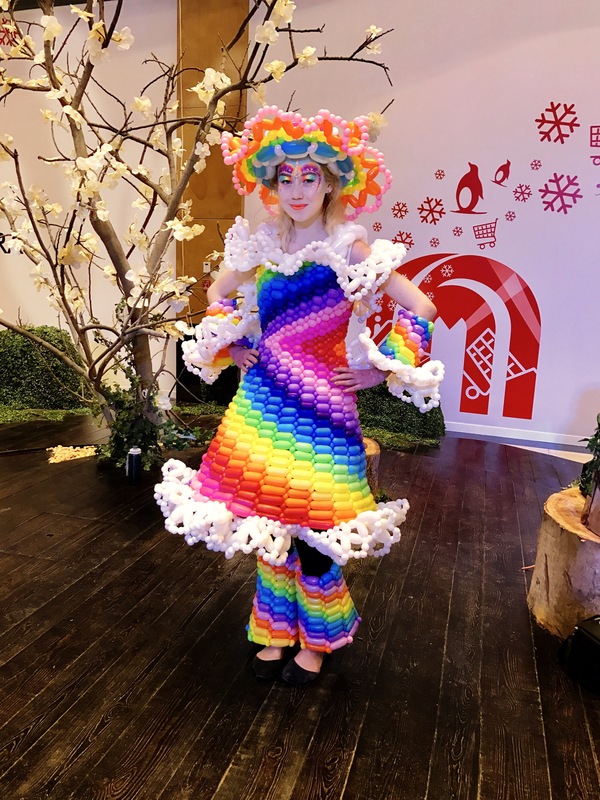 Whether it’s for a stage show at a corporate gala, or a halloween party in someone’s back yard, these balloon costumes will be the thing people talk about. 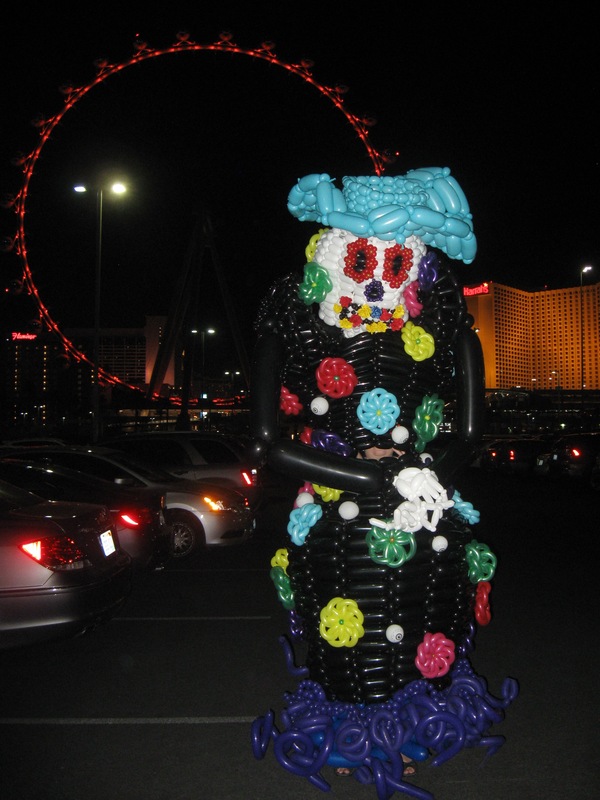 It takes balloons, imagination, twists, and dexterity to create these inflatable, wearable, pieces of art. 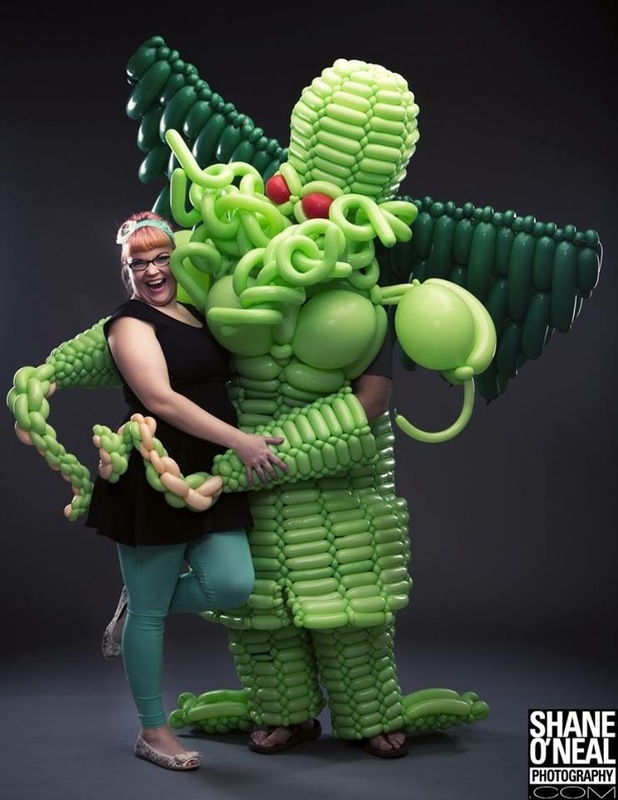 Tawney B, and her incredible team of renowned balloon artists, have dreamt up some of the world’s most unique and stunning balloon costumes. We put love into everything we design, so each costume is as unique as its wearer. 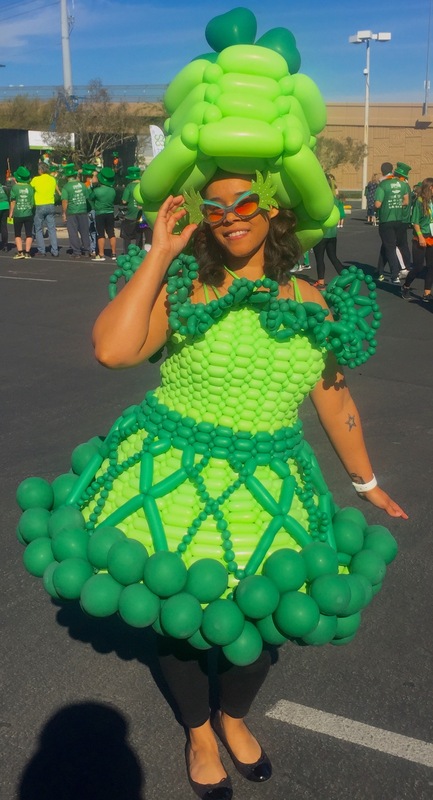 Who makes these balloon costumes? 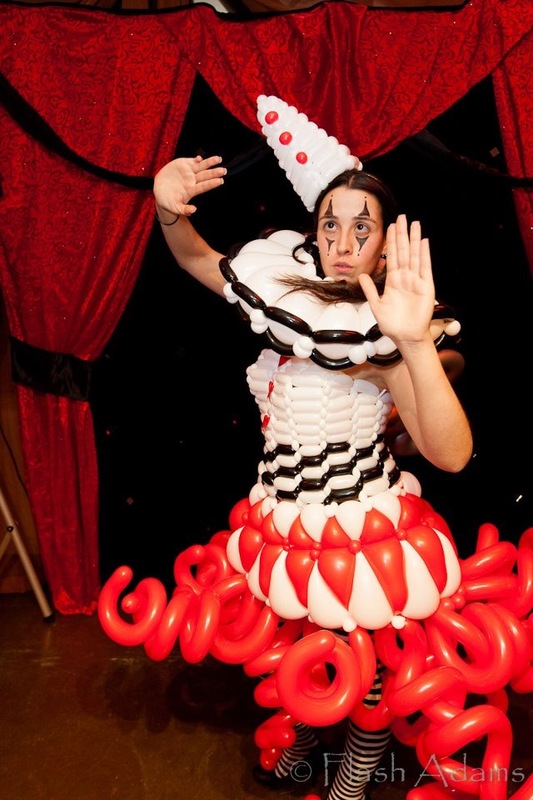 As World Inflated’s lead designer, Tawney B has had her hands on just about every single costume we’ve created. 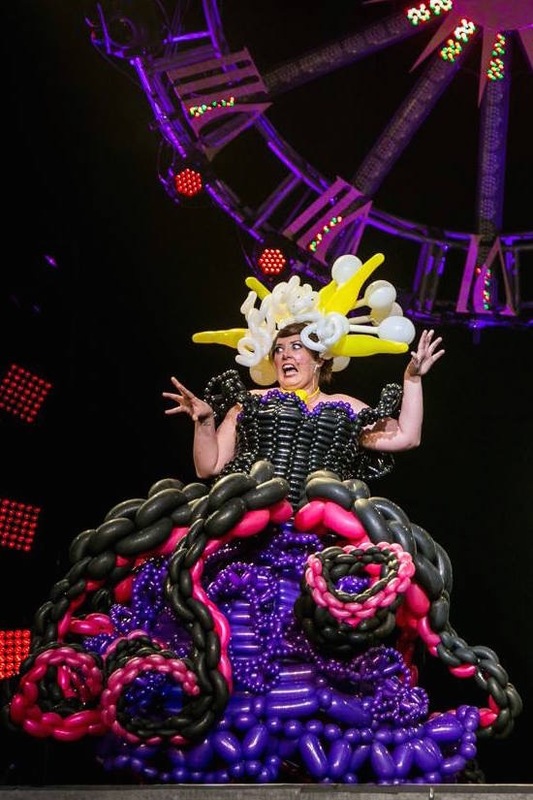 She was the featured designer for Circus Couture’s “Unlocked”, and took home first place in the 2015 T&S International Balloon Art’s costume contest. Her love of costume design and balloons have become a bit of an obsession. “I’m constantly coming up with new ideas,” she says. “I have binders and binders full of sketches all waiting to come to fruition!” Her energy and love can be seen on all of our designs, so you know you’re getting something really special. Can people actually where these? “The secret to a good design, is identifying with who is going to be wearing it.” It’s frequently Tawney hiding behind the latex, so she has a terrific sense of what makes a costume really come to life. 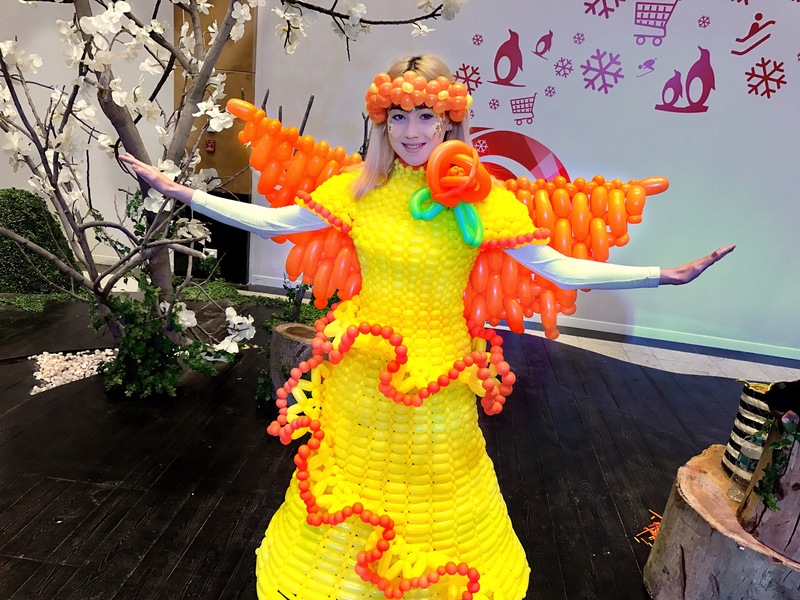 “I like to focus on what details will make it stand out, so I can create something that feels alive.” Balloon costumes and dresses are Tawney’s passion, and you get the distinct impression she smiles while making them. 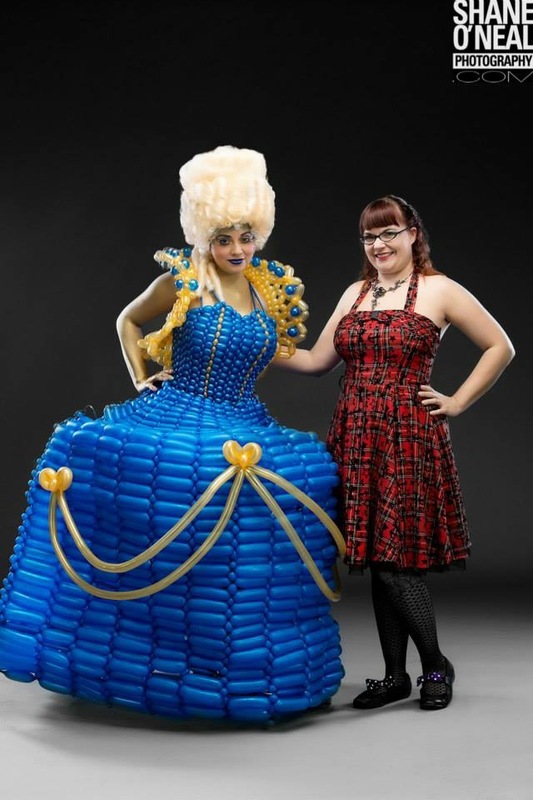 Our balloon costumes are incredibly well-made, and they are built to be played in. All the twisting, weaving, and balloon contorting is done with great precision and care. We use the highest quality balloons available on the market, so you can feel safe knowing it will hold up to the rigors of a good event. Tawney comes from a background of costume design and theatre, so she’s very aware of what makes a piece wearable. “It needs to have a level of practicality in addition to being beautiful”. 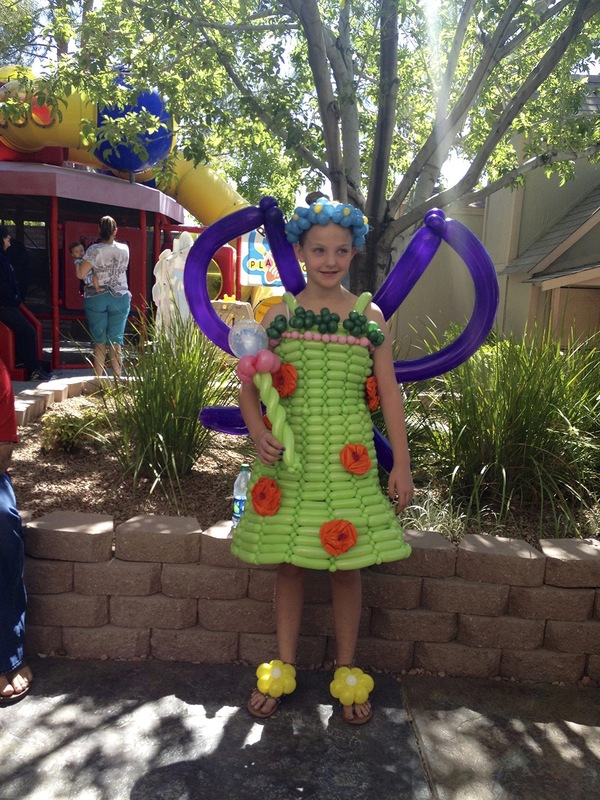 Balloon costumes take anywhere from 4 to 40 hours to create, and they are sumptuous to look at. It’s impossible not to feel happy looking at them, just because they are so full of color and whimsey. 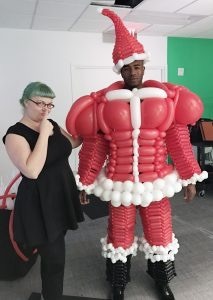 How are Balloon Costumes Built? Tawney painstakingly crawls under the costume, hovers on top of it, and she breaks her back to get it to look exactly right. The process can be a beast sometimes, but the end result is fantastic. The balloon costumes are made using a range of techniques and twists, but they are typically woven together like a basket. It turns out that underwater basket weaving class Tawney took was a great career move! 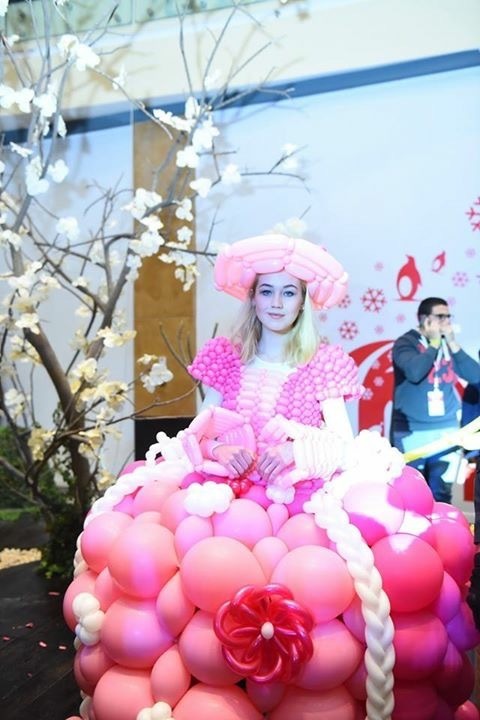 Here are a few more balloon costumes for your eyes! Ursula was created for Circus Couture’s “12”and it was modeled by Kelsey Custard. We’re pretty sure Tawney hasn’t bought an actual costume in years. This is just her in the office. We’re not sure what month it is as you are reading this but, we are already excited about halloween! This beautiful dress was made for the Mall of Egypt! (Yup. In actual Egypt). Ronnie Garr is spotted wearing a balloon costume for Lepre-Con. Tawney couldn’t find a date for prom, so she convinced her cousin Cthulhu to take her! Fairies are real, and they made their home at World Inflated! This elf is almost ready for Christmas, she just needs a little eggnog! Santa Clause is coming to town, and man, is he hot! Halloween is our busiest season, and we are totally fine with that. 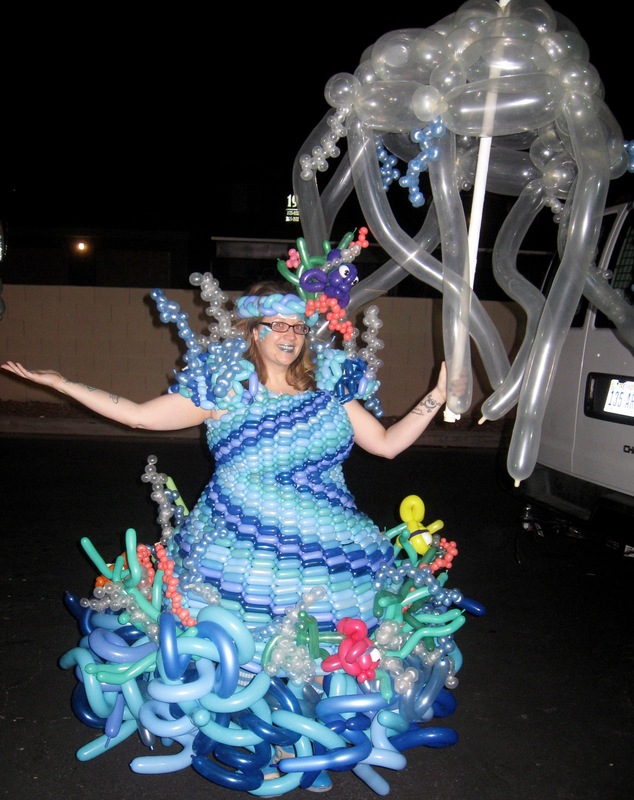 Jules Sparks wore this water themed balloon costume for the Wonderground “fundamentals” fashion show.